You are here: Home / Gold Dust Potato Processors / It’s Holiday Time Again at Gold Dust and Walker Brothers! It’s Holiday Time Again at Gold Dust and Walker Brothers! There isn’t much snow on the ground – yet. We’re crossing our fingers for a white Christmas, but whether or not our wish comes true it doesn’t change the fact that it’s the holidays at Gold Dust and Walker Brothers! Between Thanksgiving and New Years Day, the holiday season kicks off while the farm quiets down a little and the packing shed goes in to full swing. Trucks line the driveway, waiting to be loaded with chipping potatoes. Inside our offices, though the din of the processing plant hums in the background, in some of the offices Christmas music can be heard playing in the background. 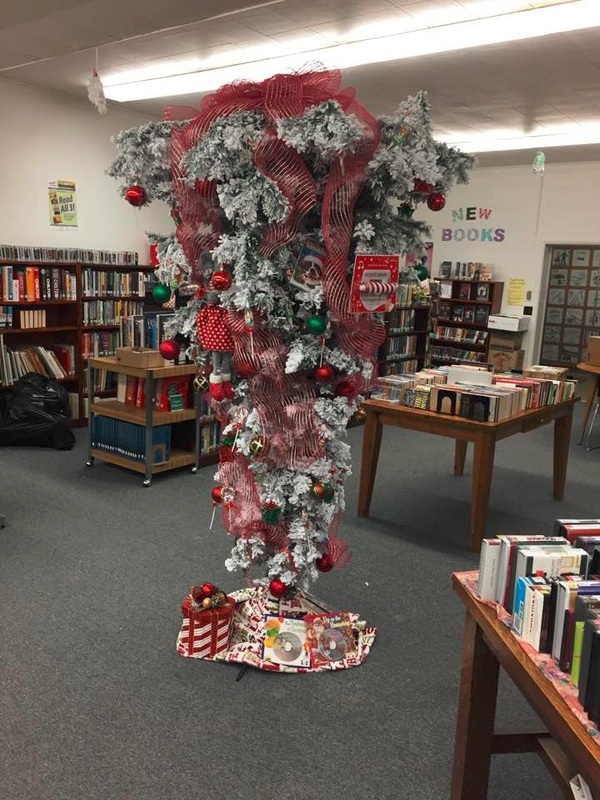 What a perfect tree for a library! Thanks to Christa Moore for the photo! This year, Bill, Jan, Tricia and Tricia’s husband, Darcy, attended the Klamath Basin Assistance League’s Christmas Tree Jubilee at the Running Y Resort. 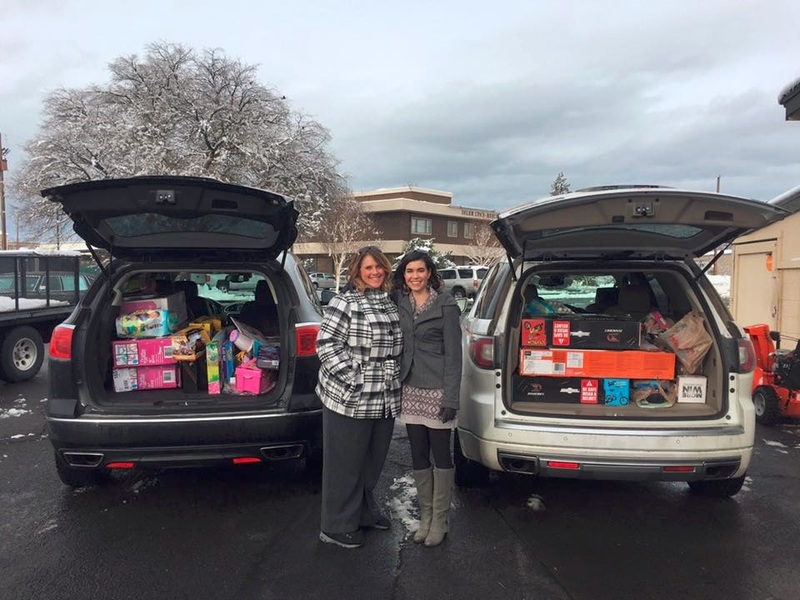 This organization does a lot of good work in the Klamath Basin, and one of their primary campaigns is raising money for Operation School Bell which allows poor children to go shopping for school clothes. Bill, who was caught in the Christmas spirit, had one tree in particular he wanted. After the bidding ended, he won the upside down tree he was after! Instead of having it set up at his house or at Gold Dust’s headquarters, the tree and the goodies that came with it were donated to the Malin Library, where it is on display. Bill also managed to get another smaller tree for the shed! This time of year is also when Gold Dust and Walker Brothers hold the annual Holiday Leadership Meeting. This year the meeting was held at Italianna’s Ristorante and Gelateria, located just off of Shasta Way in Klamath Falls. While our guests enjoyed drinks, dinner and dessert, Tricia, Lexi, Bart, Matt, John and Weston gave presentations. The main topic of the evening was how the shed and the farm could save money. Though Gold Dust and Walker Brothers are in a good position, the situation for agriculture in general is looking down. To preemptively beat the downturn, our managers turned to our businesses’ employees for their thoughts on how, as John put it, “we can pick up the pennies”. Ideas ranged from having a different time clock system to moving pay day. Along with making the businesses leaner and meaner, Tricia and Lexi asked the group for keywords to describe the ideal Gold Dust and Walker Brothers co-worker. The results? Ownership of tasks and duties, strong work ethic, and a positive outlook. Honorable mention attributes included honesty, “no drama” and the ability to not only work well with others but to also work independently. Toby looked pretty amped for the dinner and meeting! Bart and Matt sharing how safety initiatives and insights can bring down costs. This meeting is also when our most outstanding employees are recognized for their contributions. The first person recognized represented many of the traits that were mentioned that make an ideal co-worker – he takes ownership, has a strong work ethic and displays dedication. And when presenting Kelly Cole with his award, Weston also pointed out his strong, positive attitude. The next award was presented by Lexi for an employee who “took on a project no one conquered”. Not only did he take over our ag drone program, he handled the GAP audit, the food safety audit and the organic audit. And, according to Matt, Jeremy Turner was the model for ownership. The last employee was recognized by John, and this fellow started off with us as a spud truck driver. Weston loves to tell the story of how his truck got stuck in a field his first harvest with Walker Brothers, and when he was told the only way to get out was to dig it out, he found a shovel and proceeded to do just that. Through his tireless dedication and work ethic, he’s now in charge of many of Walker Brothers’ important processes, from training potato truck drivers to taking care of the seed potato. Not only does this man go above the call of duty, our agronomist, Sachin Rawat, says Dan Pappe is a good teacher. Thank you Dan for your years of dedication, and thank you to Kelly and Jeremy for stepping up and exemplifying the virtues that help Gold Dust and Walker Brothers thrive! Weston and John presenting Kelly an award for his hard work and dedication on the hay farm. It wouldn’t be a holiday blog post without mentioning our favorite way to give back to the community – our company toy drive. This year, our employees contributed $166.15, which Gold Dust matched, and gave 25 gifts. In the end, this resulted in 66 gifts donated to our local Toys for Tots drive! Well done! That’s quite a haul from Gold Dust and Walker Brothers’ employees! Well done! But the toy drive wasn’t the only event in our offices. The Gold Dust office staff held their annual ugly sweater contest and had a Secret Santa gift exchange to help celebrate the season. Weston took home the dubious honor of having the ugliest sweater, followed by Lexi. All in all, though a little more low-key than year’s past, it was a wonderful way for our staff to get together before Christmas. Before we wrap this up, to our employees who make our businesses great to the folks we do business with that have helped us grow, we would like to wish all of you the merriest of Christmases and happiest of New Years. We hope that everyone is able to get together with the ones they love, and that 2017 is bright and prosperous.